Getting ready photos. I love doing this such has details and the bridal party getting their make up and hair done, or just watching the bride and being so happy for her. As a Dunes West Golf River Club wedding photographer as I got to this venue, I was going to start with the groom and groomsmen, well it happened to be that some of the groomsmen where a little late, so while that was going on, I heard giggling from the bridal suite, I knock on the door and asked if I could come inside and capture a bunch of fun candid moments of the bride and bridesmaids. 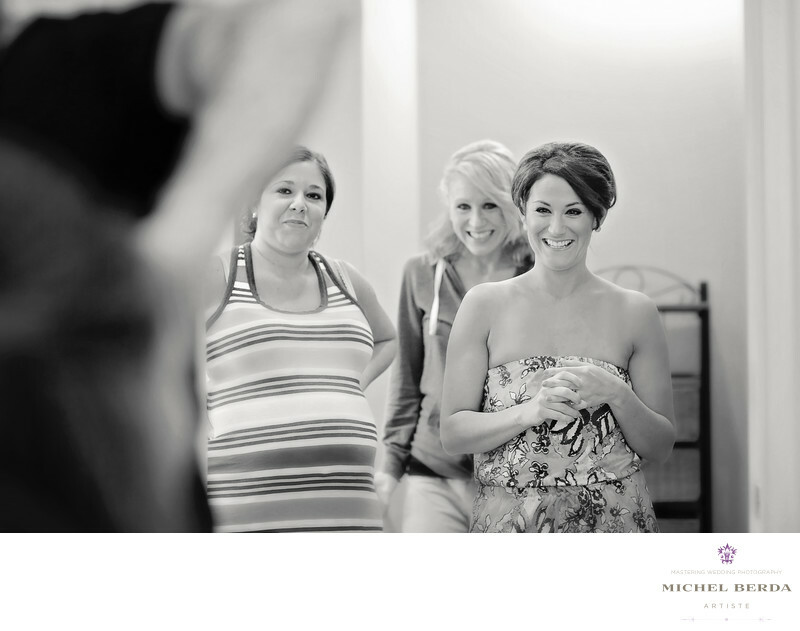 The bride was getting her hair done at this moment and I noticed has I moved from one spot to another that the image I was looking to document was quickly approaching, 3 bridesmaids looking on with smiles at their friend as she stood there looking at them. When I photograph an image like this at this as a Dunes West Golf River Club as a wedding photographer I want to make sure my image tells that story, and why I always include that in my frame. As you look at this image in B&W, you notice that exact moment frozen, captured properly and well to show the bridesmaids doing what they do best loving their bride friend. Keywords: best wedding photography (45), bride (66), dunes west golf river club (9), groom (69), Michel Berda (1140), mount pleasant (39), photographer (1125), photography (75), venue (45), Wedding (90), Wedding Photographer (1254), Wedding Photographers (198).